Check our Frequently Asked Questions/User Guides and Training Videos. Here are some of our frequently asked questions which we hope support you in your journey to finding and using the perfect payroll and Single Touch Payroll (STP) solution. In this section we outline the steps involved to change your Password. In this section we provide the steps involved in deleting a payslip. Note: Payslips should be deleted in date order from the most recent payslip being deleted first. If you need to delete a payslip that is not the most recent one, then you should delete the most recent payslip first, then the second last payslip next and so on until you get to the payslip in question. Deleted payslips that require amendments or reprocessing should then be re-entered in date order, starting with the earliest payslip. This allows the database to maintain its integrity and ensure the year to date and accrued entitlement balances remain correct. If you have questions on this, please call us on 02 8084 9222 during business hours. In this section we outline the steps involved in processing Annual Leave (Holiday Pay) amounts. If you have a staff member that is entitled to Annual Leave (also referred to as Holiday Pay) you will firstly need to set this up in their Employee Record. To do this, please refer to the Help guide ‘How to Edit Employee Entitlement Details’. This guide also shows you how to select Annual Leave Loading (if applicable) to any Annual Leave payments you make. By selecting this option, the system will automatically calculate Annual Leave Loading on any Annual Leave payments. Now that your employee has been set up for Annual Leave, you need to include this when using the ‘Process’ Payroll function. For example, if your employee works a standard 38 hour week and they had 3 days Annual Leave in that week, then their base hours = 15.2 Hours (2 days) and Annual Leave hours would be 22.8 (3 days). 3) When you have entered all of the required information for your employees payslip, you need to hit the [Process] button at the bottom of the screen and the Payslip will be generated for you to review. 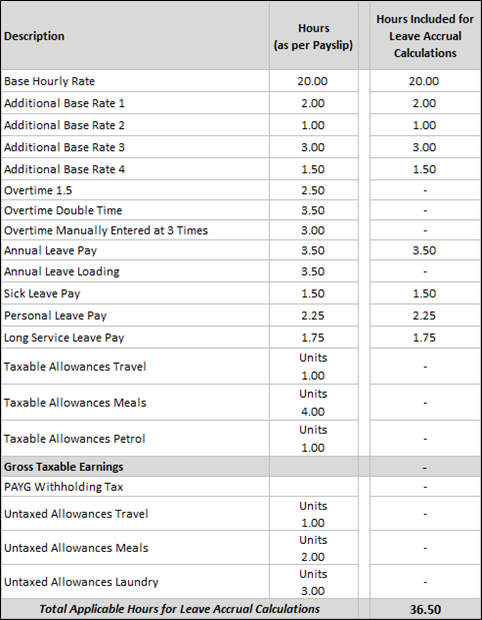 Note that the Base Hourly Rate Hours in the above payslip are 15.20 as outlined above. 5) If you are happy with the values, you click the paper plane icon in the top right of the screen to finalise the processing of the payslip. In this section we outline the steps involved in processing Overtime amounts. When should I use Overtime Amounts? Overtime amounts are used when you pay your employee for hours they work that are in addition to their usual working hours. What is the difference between Overtime and Additional Base Hourly Rate Payments? Overtime is used when you are paying your employee for hours that they have worked in addition to their usual hours of work. Overtime is generally not considered Ordinary Time Earnings for Superannuation Guarantee purposes, therefore EasyPayslip does not calculate any Superannuation Guarantee amounts on any Overtime payments. These rates are then multiplied by the hours worked and Base Hourly Rate. This is explained further below (refer items 6, 10 & 14). Additional Base Hourly rate payments differ from Overtime in that they represent regular hours that your employee works each period but that are paid at a different rate to their Base Hourly Rate. How do I include Overtime Amounts when processing a payslip? In order to process Overtime payments, you must have selected ‘Yes’ in the Employee Payroll set up screen. If you did not select ‘Yes’, no Overtime option will appear when you go to process their Payslip. The formula for Time & a Half = Base Hourly Rate ($20.00 in this example) x 1.5 (Time & a Half Rate) = $30.00 / hour. 7) When you have entered the hours in the [Total Overtime] field, you then hit ‘Done’ on the keypad. The system will automatically calculate the ‘Total Amount’. Note: If you realise you have made an error at this stage of entering the Overtime information, you are unable to delete the amounts from this screen. Instead you will need to click the ‘<‘ arrow in the top left of the screen and then hit the ‘X’ in the Process Payroll screen and restart the Payslip process. 10) In this example we have chosen to add 2 hours Overtime at Double Time (2.0) amount in line with steps 3-8 above. The formula for Double Time = Base Hourly Rate ($20.00 in this example) x 2.0 (Double Time Rate) = $40.00 / hour. 14) In this example we have chosen to add 4.5 hours at an Overtime Rate of Three & a Half Times (3.5) in line with steps 3-8 above. The formula for the Manually Entered Rate = Base Hourly Rate ($20.00 in this example) x 3.5 (Manually Entered Rate for this example) = $70.00 / hour. 18) When you return to the Process Payslip screen you will see that the total of all the Overtime amounts as shown below. 19) When you have entered all of the required information for your employees payslip, you need to hit the [Process] button at the bottom of the screen above and the Payslip will be generated for you to review. If you are happy with the values, you click the paper plane icon in the top right of the screen to finalise the payslip processing. In this section we outline the steps involved in processing base hourly rate additional amounts. When should I use Base Hourly Rate Additional Amounts? Base Hourly Rate Additional amounts are used when you pay your employee using more than 1 standard hourly rate in their payslip. What is the difference between Additional Base Hourly Rate Payments and Overtime? Additional Base Hourly rate payments are for regular hours that your employee works each period, that are paid at a different rate to the Base Hourly Rate entered in the Employee Setup/Edit Screen. As Additional Base Hours are commonly considered regular hours of work, they will generally fall under the category of Ordinary Time Earnings and as such, you would be liable for Superannuation Guarantee on these payments. EasyPayslip therefore does calculate Superannuation Guarantee on all Additional Base Hourly Rate payment amounts. Overtime on the other hand is generally not considered Ordinary Time Earnings for Superannuation Guarantee purposes. As such, EasyPayslip does not calculate any Superannuation Guarantee amounts on any Overtime payments. How do I include Base Hourly Rate Additional Amounts when processing a payslip? When you are in the Process Payroll screen, you can include up to 4 separate Additional Base Hourly Rate payments in each payslip. 8) When you are happy with the values entered and the Total Amount is correct, you then need to hit the ‘Done’ button on the keypad and the following screen will then appear. Note: If you realise you have made an error at this stage of entering the Additional Base Hourly Rate information, you are unable to delete the amounts from this screen. Instead you will need to click the ‘<‘ arrow in the top left of the screen and then hit the ‘X’ in the Process Payroll screen and restart the Payslip process. 14) When you return to the Process Payslip screen you will see that the total of all the Additional Base Hourly Rate amounts as shown below. 15) When you have entered all of the required information for your employees payslip, you need to hit the [Process] button at the bottom of the screen above and the Payslip will be generated for you to review. 12) You will then see the [Saved] header appear and be moved to the first page of the ‘Payroll’ section. Hit [Finish] to go back to the ‘Employees’ home screen, or continue editing in the ‘Payroll’ section. To edit the ‘Annual Salary’, click in the field and a Numeric Keypad will pop up on your screen to enable you to edit the $ amount. 7) You can then edit the frequency of their payments to be either, Weekly, Fortnightly or Monthly. Note: If you select ‘Weekly’ the standard hours will be 38. You can edit this field to the amount of hours your employee works if required. Note: If you select ‘Fortnightly’ the standard hours will be 76. You can edit this field to the amount of hours your employee works if required. Note: If you select ‘Monthly’ the standard hours will be 164.67. You can edit this field to the amount of hours your employee works if required. Note: To edit the ‘Hourly Rate’, click in the field and a Numeric Keypad will pop up on your screen to enable you to edit the $ amount. 14) You will then see the [Saved] header appear and be moved to the first page of the ‘Entitlements’ section. Hit [Finish] to go back to the ‘Employees’ home screen, or continue editing in the ‘Entitlements’ section. In this Section we cover how to edit your employee’s entitlement details. Note: The Carried Over Balance is their Annual/Holiday Leave Balance at the time of setting them up in EasyPayslip. Annual/Holiday Leave is accrued at 7.6923% (This provides 20 days leave each year based on a 38 hour week). Note: The Carried Over Balance is their Personal Leave Balance at the time of setting them up in EasyPayslip. Personal Leave is accrued at 3.84615% (This provides 10 days leave each year based on a 38 hour week). Note: The Carried Over Balance is their Sick Leave Balance at the time of setting them up in EasyPayslip. EasyPayslip does not accrue Sick Leave for Employees. However, the Carried Over Balance amount less any Sick Leave hours taken are included in the Personal Leave Accrued Entitlements Balance. Note: The Carried Over Balance is their Long Service Leave Balance at the time of setting them up in EasyPayslip. In this Section we cover how to edit your employee’s tax details. Note: Your employee should provide you with a Signed Tax File Number Declaration. In this Section we cover how to edit your employee’s superannuation details. Note: Your employee should provide you with a Signed Superannuation Standard Choice Form. They will also need to provide you with a letter from their nominated superannuation fund that states the fund is allowed to accept employer contributions and that it is a complying fund. It should also provide details on how to make contributions to the fund. The Superannuation Standard Choice Form is available in the ‘Settings’ screen under ‘Documents’. If you need further information, you can refer to the Superannuation Guarantee Administration Act 1992. Note: Current legislation requires employers to contribute at the rate of 9.5% until 30 June 2020. Single Touch Payroll (STP) is a new way for small business owners that employ staff to process payroll and report tax and superannuation information back to the Australian Taxation Department (ATO). Please note that payments made to employers will not change. The only thing changing is how you report this information to the ATO. When will small business owners need to be STP compliant? Small business owners can start reporting directly to the ATO from 1 July 2019. How often do I need to report payroll information to the ATO? Employers are required to report payroll information to the ATO on or before each day their employees are paid i.e. every pay day. How does STP affect employees? Employees are not affected by STP. Payslips through Easy Payslip can be easily emailed to them by their employer through the mobile or desktop app. If you are an employee concerned about receiving your payslip, please get in touch with your employer. Can I do STP on my smartphone? Yes, employers can process payroll on their smartphone with the Easy Payslip payroll app that is available on Apple and android devices. To get started, simply download the app via the App Store or PlayStore. How to calculate pay as you go (PAYG)/PAYG? The Easy Payslip app calculates employee pay as you go (PAYG) information within the app. Once your employees have been loaded into the app, with salary information, bonuses and entitlements, the income tax withheld is calculated within the Easy Payslip app. In order to maintain a simple and easy to use App, the YECP can be generated by both a mobile device or via the website (www.easypayslip.com). However the Employees Individual Payment Summaries and the Employer Payment Summary Information will only be available for download by accessing your account via the website. Note: If you do not wish to proceed with the Year End Close Process, you need to hit the [CANCEL] button and this will return you to the ‘Settings’ screen. Note: As stated in the above pop up screen, the Authorised Name is required to create your Employees Payment Summary so that they can be lodged with the ATO. 11) You can now continue processing Payslips with a payment date within the dates of 1 July 2018 – 30 June 2019. As part of the YECP, you should also receive emails to your employer email address for all of your staff’s individual Payment Summaries. You can download these documents or forward them on, depending your own business practice. The EasyPayslip website also has the Employee Payment Summaries listed in the Reports section. You use the same details to log into the website as you do for the App on your mobile device. Note: If you do not wish to proceed with the Year End Close Process, you need to hit the [NO] button and this will return you to the ‘Settings’ screen. In this section we explain how Personal (& Sick) Leave Accruals are calculated and displayed in a Payslip. What is the difference between Personal & Sick Leave? Personal Leave is accrued at the rate of 3.84615% for each applicable hour your employee works. This provides 10 days Personal leave each year based on a 38 hour week. How does Easy Payslip calculate Personal Leave Accruals? As can be seen in the above example, 36.50 hours will be used in determining the hours accrued for this pay period. As shown in the example above, this is 36.50 hours this period. As noted above Personal Leave is accrued at the rate of 3.84615% of each applicable hour your employee works. (This provides 10 days leave each year based on a 38 hour week). = 36.50 x 3.84615% = 1.40 Hours. Therefore 1.40 hours of Personal Leave will have been accrued by the Employee this pay period. As shown in the example above, the employee had 2.25 hours of Personal Leave this period. Therefore at the end of Payslip 1, the employee would have 7.15 hours of Personal Leave remaining. Easy Payslip will continually calculate and display the updated accrued hours in each payslip. For example, if we assume your employee works a 38 hour week for their second payslip (with no Leave taken), they will accrue 1.46 hours of Personal Leave (38 hours x 3.84615% = 1.46). No leave calculation will occur. Sick Leave will be shown on the payslip to show the ‘$’ paid, however no ongoing calculation is performed by the system. If both Personal Leave and Sick Leave are selected in the Employee set up, then the Personal Leave accrual calculation will include the Sick Leave hours, as shown below. Therefore 1.40 hours will have been accrued by the Employee this pay period. Therefore at the end of Payslip 1, the employee would have 7.65 hours of Personal Leave remaining. Your employee can have a negative Leave Entitlements Balance. In this section we explain how Annual Leave Accruals are calculated and displayed in a Payslip. How does Easy Payslip calculate Annual Leave Accruals? Annual Leave (also referred to as Holiday Pay) is accrued at the rate of 7.6923% of each applicable hour your employee works. (This provides 20 days leave each year based on a 38 hour week). = 36.50 x 7.6923% = 2.81 Hours. Therefore 2.81 hours of Annual Leave will have been accrued by the Employee this pay period. As shown in the example above, the employee took 3.50 hours of Annual Leave this period. Therefore at the end of Payslip 1, the employee would have 19.31 hours of Annual Leave remaining. For example, if we assume your employee works a 38 hour week for their second payslip (with no Leave taken), they will accrue 2.92 hours of Annual Leave (38 hours x 7.6923% = 2.92). In this section we explain how Long Service Leave Accruals are calculated and displayed in a Payslip. How does Easy Payslip calculate Long Service Leave Accruals? = 36.50 x 1.6667% = 0.61 Hours. Therefore 0.61 hours of Long Service Leave will have been accrued by the Employee this pay period. As shown in the example above, the employee took 1.75 hours of Long Service Leave this period. Therefore at the end of Payslip 1, the employee would have -1.15 hours of Long Service Leave owing. For example, if we assume your employee works a 38 hour week for their second payslip (with no Leave taken), they will accrue 0.63 hours of Long Service Leave (38 hours x 1.6667% = 0.63). Already using Easy Payslip? Sign in.